During the month of February, students in Grades 1, 2 and 3, will participate in the Making Tracks Program during their Physical Education class. This Program is developed by The York Region Health Department. This Program is designed to encourage students/children and their families to: safely use active transportation; to better preserve the environment; to increase people’s physical activity; and to improve traffic safety. The central goal of the Making Tracks Program is to create and co-ordinate a broad and accessible, skill-based, active transportation safety education program for students/children through experiential learning. 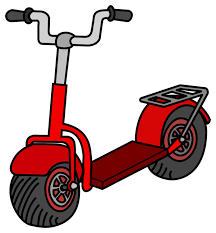 Ms. Linardi and Mr. Porcelli will teach students how to properly and safely ride scooters, so that they will have the skills necessary to ride them to school, to increase their physical activity. Students will learn how to ride scooters, during their gym class, over a two week period. Next Story Next post: Carnaval/Carnevale Week!